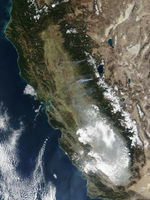 On Monday morning and afternoon, November 25, 2002, the Moderate Resolution Imaging Spectroradiometer (MODIS) instruments on the Terra and Aqua satellites captured these true-color images of fires (red outlines) burning in California.Fires are burning in the mountains west of Lake Tahoe, on the California-Nevada border. 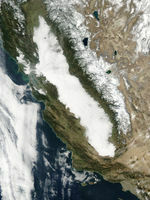 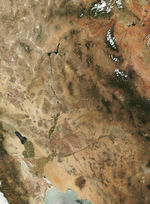 Smoke streams westward from the fires, which are burning in the Sierra Nevada Mountains. 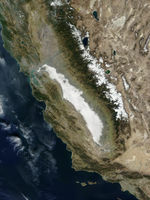 Other fires are scattered across the state, and in the full scene, what could be a mixture of smoke and urban air pollution is nestled into the San Joaquin Valley.